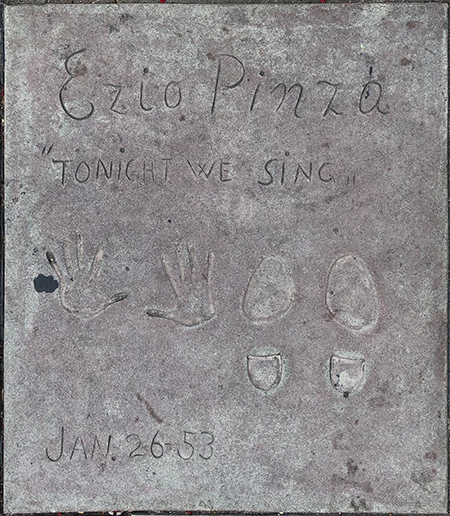 Ezio Pinza was a popular opera singer, who spent many years at the Metropolitan Opera in New York. Upon retiring, Pinza found a new career singing in Broadway shows and the movies. He was another of the emerging strata of European personalities to permeate American culture after World War II. Born in modest circumstances in Rome, Italy, Fortunio was raised in Ravenna. He studied singing in Bologna's Conservatorio Martini, and made his opera debut in the city of Cremona in the role of Oroveso in Bellini's Norma in 1914, at the age of 22. Pinza served in the Italian Army during the World War, then resumed his operatic career. By 1919, he had made his debut at the famous La Scala Opera House in Milan, working with the dynamic conductor Arturo Toscanini. Although unable to sight-read musical notation, Ezio learned his roles by ear, which requires a pretty good memory. He easily became an audience favorite for his mellow bass and relaxed stage presence. Italian-born opera singers were common at the Metropolitan Opera in New York City, where Pinza made his debut in Spontini's La Vestale in November of 1926. Becoming a member of the company shortly thereafter, he was a regular fixture at the Met and on tour until 1948. Over his career at the Met, he sang the role of Ramfins in Verdi's Aida for 74 performances. Beginning in 1929, he sang the title role in Mozart's Don Giovanni 65 times; played Méphistophélès in Gounod's Faust 64 times; Don Basilio in Rossini's Il Barbiere di Siviglia 55 times; played Figaro in Mozart's Le Nozze di Figaro 48 times; Colline in Puccini's La Bohème 46 times; Escamillo in Bizet's Carmen 40 times; the title role in Mussorgsky's Boris Godunov (in Italian) 35 times; Raimondo in Donenzetti's Lucia di Lammermoor 31 times; Alvise in Ponchielli's La Gioconda 30 times, and many, many others. Touring the country with the Met for such a long period made Pinza a household name. An interesting aspect of Pinza's career is that, although he tried the Wagnerian roles, he was a complete wash-out in Tannhäuser, Lohengrin, and Tristan und Islode. He seemed to have trouble with the heavier Puccini works, such as Tosca and Turandot. Pinza would not usually perform in concert music, but he did perform the bass part in Beethoven's epic Missa Solemnis with Toscanini and the New York Philharmonic at Carnagie Hall in 1935, and took the bass part in Beethoven's Ninth Symphony with Toscanini and the NBC Symphony at Carnagie in 1938. After bidding the Met "farewell" Pinza got the part of Emil de Becque in Rodgers and Hammerstein's musical South Pacific, which ran for 1,925 performances on Broadway from April, 1949 to January, 1954 at the Majestic and Broadway theatres. He also played the role of Cesar in a musical version of Pagnol's Fanny for 888 performances at the Majestic and Belasco theatres from November, 1954 to December, 1956. He recorded albums for both shows. Okay then. He sang the airas "Il lacerato spirito" from Verdi's Simon Boccanegra, and "Fin ch'han dal vino" from Mozart's Don Giovanni in the film Carnagie Hall (released in February, 1947). He was signed to an M-G-M contract and they shot out Mr. Imperium (released in March, 1951) with Lana Turner. How could it miss? - it had Marjorie Main in it! Then there was Melvin Frank and Norman Panama's Strictly Dishonorable (released in July 1951) with Janet Leigh. How could it miss? - it had Millard Mitchell in it! Television beckoned. Pinza answered the call by appearing in his own variety show on NBC, The Ezio Pinza Show which ran for 21 episodes in 1952. But like a lot of people who were trying to find a place in a changing media landscape, he bounced back for one more film at M-G-M, called Tonight We Sing (released in January, 1953). David Wayne plays impresario Sol Hurok, with Pinza playing the part of Russian bass singer Feodor Chaliapin. After that, Pinza got his own sitcom on NBC. Bonino told the story of a widower opera singer and his large family and their cranky housekeeper. It lasted 16 episodes in 1953. Pinza suffered a fatal heart attack at his home along the Westchester Country Club and was given a large funeral at St. John the Divine Catheral in New York City. 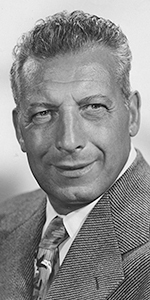 His Ezio Pinza: An Autobiography was published after his death in 1958. Grauman's Chinese Theatre, Hollywood, California. Ezio Pinza Forecort ceremony, Monday, January 26, 1953. 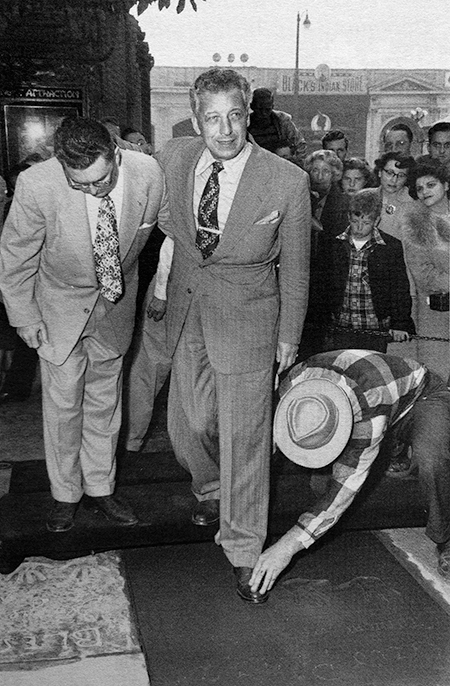 Grauman's Chinese Theatre manager Ralph Hathaway helps steady Ezio Pinza, as cement artist Jean Klossner makes the impression of Mr. Pinza's shoe.